Uglyworld #651 - The Power Of Inception (199-365), originally uploaded by www.bazpics.com. This evening Babo and Cinko came with me to the local cinema to see the new film from Christopher Nolan called "Inception" featuring Leonardo DiCaprio, Cinko was on the edge of his seat the whole time with excitement and managed to knock over his popcorn at one stage at a scary part. Babo on the other hand was pretty quiet during the film, almost as though he was concentrating 110% on the storyline of the film. After we returned to the hotel he decided that it was time to give it a try for himself, so he waited until I was asleep and then managed to somehow get inside my head into my dream. I argued with him that I wasn't asleep but he then said, "I can proves it, comes into the bathrooms and sees!". This had me somewhat intrigued so of course I followed Babo into the bathroom where he explained his theory, "Okies, when you is awakes I can stands in front of the mirror and you can sees me, yes?". I nodded my head in agreement, to which he continued, "So when Babo is corrects that this is onlys a dream I can stands in fronts of the mirror and then because I plants an idea in your head that you can't sees my reflection it's then possibles for me not to makes a reflection, you agrees?". Again I nodded my head in agreement. 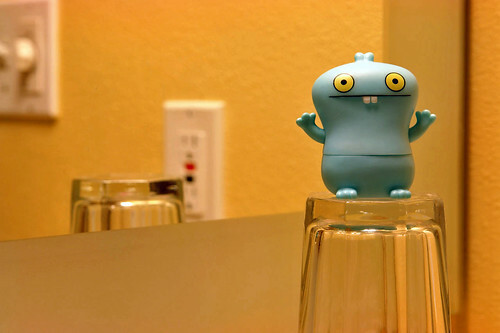 Babo jumped up in front of the mirror and sure enough there was no reflection of him in the mirror and I was just about to concede to his argumentation when I heard Ox screaming at the top of his voice, "Helps, helps, Babo has no reflections, he musts be's a vampire, helps us somebody". this movie looks like a matrix movie but this is amazing it make more effect through the help of 3d and some newest gadets.